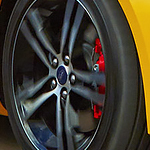 Explore Ford Focus ST Features | Fred Martin Ford Inc. The Ford Focus ST, a popular compact performance hatchback, offers elite style, exhilarating performance, and many great interior features. Come and check it out at Fred Martin Ford Inc. to see why many drivers consider the Ford Focus ST a must-have vehicle. There are so many exciting interior features in the Focus ST, it’s hard to know where to start. From the leather-trimmed front seats, partially leather-trimmed rear seats and leather-wrapped steering wheel, the Focus ST is luxury all the way. The Focus comes with manual climate control with dual-zone automatic temperature control also available. Floor console armrest, dome lamps and dual illuminated visor vanity mirrors are a few of the many interior options. If hearing about the Ford Focus ST doesn’t make you want to rush out and buy it, seeing it just might make you a believer. Visit our dealership soon and take it out for a test drive.